The image above was one of my favorite street shots I took during the Instawalk through the Nuremberg subway system I joined last week. I got enough material for 2-3 posts about the walk organized by the admins of the Nuremberg Instagram community. I took the photograph with my new favorite cam/lens combo, the Olympus OM-D E-M1X and the mZuiko 12-100mm F/4 Pro Zoom. Another example of the great image stabilization of the Oly cam. I shot this handheld at .4 sec at ISO 200. 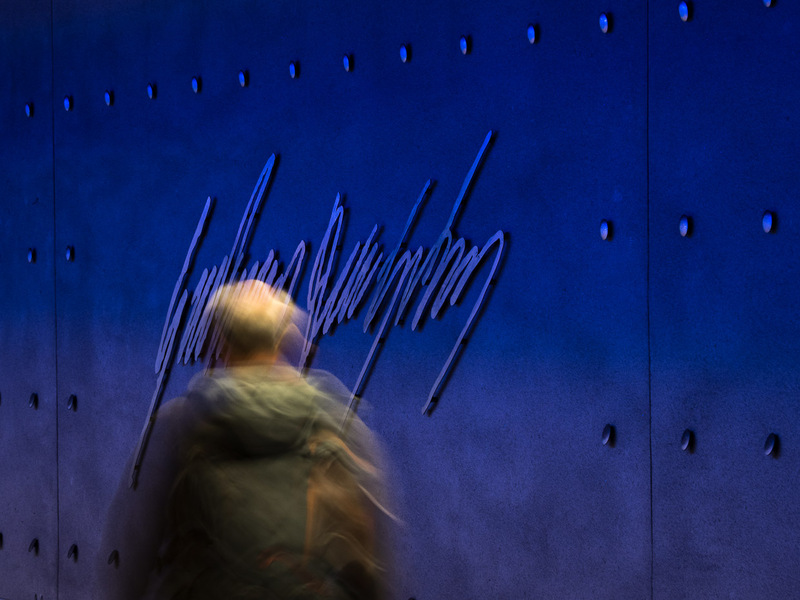 And I got the intended results, capturing the motion of the walking commuter in front of the pin-sharp design wall of the Gustav-Adolf-Strasse subway station. Have I mentioned that The Significant Other called me “crazy” for all the stuff I’m getting my hands in? Another project I’m working on is the launch of the concept for an English language independent quarterly print magazine that celebrates creativity in all its forms in the area of Nürnberg. Together with some fellow creative minds, we have entered the project as part of an activity in the context of Nuremberg’s bid to become European Cultural Capital in 2025. 95 projects have been submitted and are open for public voting. The ten projects with the most votes will receive 5000 Euro funding and will be realized. Stay tuned for a more in depth introduction and me asking you to submit your votes in favor of our project. If you are not as much in a rush and are looking for tips and inspirations around photography, check out my free Learning Center. Great capture Marcus! I hope that you and your family have a wonderful Easter weekend!! Sending you quiet moments of bliss. May the time fly until your much deserved chilled Easter weekend. I can only imagine how busy things have been. Hugs. Congratulations on this wonderful image, Marcus — and also on your contributing to Nuremberg’s bid to become European Cultural Capital in 2025! If your work and creativity and any indication of the Nurembergers’ talent, your city deserves the prize. Well done, Marcus. I admire your energy! Your creative reach is long. Last evening I drove over a bridge and noticed how beautiful the curved railing looked in fading light and realised your work has impacted me in such a positive way. I see things I didn’t notice before.